For Some of My Favourite Songs I utilised Pure Data Extended (I’m using a beta version) to read the audio files and then save them as images. Pure Data is usually used for the production of music and/or generative live visuals, so to using it to produce jpg images from almost nothing, or random data input is quite new to me! The most important part of this process is knowing how to construct and apply a jpg header to data. Wikipedia informed me that all jpg images begin with FF D8. I thought that all I would need to do is use a hex editor, such as Ghex or Bless Hex Editor, to add those byte values to a file. Unfortunately this is not the case at all. There’s so much more in a jpg header, such as Huffman Tables, Quantization Tables, bytes to define the width and height of an image, and much more that I still don’t quite understand. 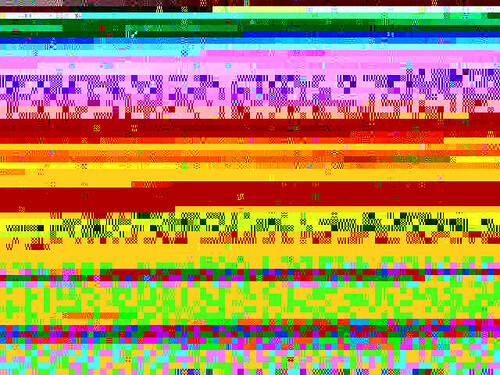 I attempted to grab data from the beginning of a random jpg file, but this included lots of extraneous data such as camera make, program(s) used to modify the photo, gps data and creation date. This data amounted to several kilobytes, which is far too much data for a header. What I needed was a “vanilla” or plain header that I could apply to any file. mesmeon showed me the HEADer REMIX project by Ted Davis. The header values on the left of the screen are used for glitching every image, be it the default image or one taken by a user. I saved the default image, manually extracted the header image, ran it through exiftool and then ended up with a header for a 640×480 image that is only 588 bytes! Now that I had a vanilla header I had to devise a way to use it in Pure Data. 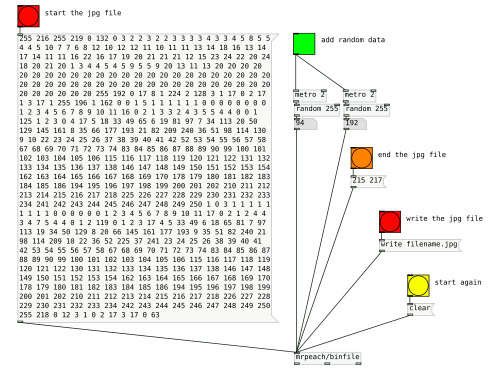 The [binfile] object allows the reading and writing of binary data. 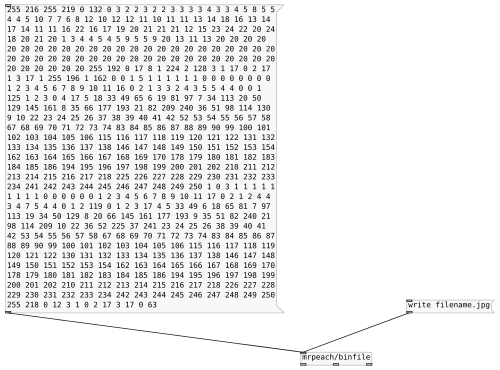 Adding data to [binfile] is a case of sending a message containing numbers to the object. [binfile] reads and outputs data as decimal values i.e. numbers from 0 to 255. I needed to find a way to add the decimal values of the vanilla header to a message box. 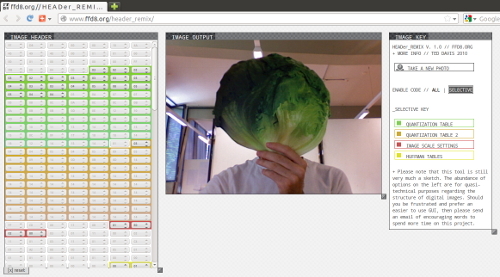 Martin Meredith helped me with this whilst we were tackling bugs at the Ubuntu Global Jam. Using hexdump I was able to output all of the hex values to decimal values. With this output I copy/pasted the values into a message box, and whenever I needed to add a jpg header to a file I clicked on the message box! To then write the file I sent the message [write filename.jpg( to the [binfile] object. Using this data alone you may notice that the jpg image doesn’t open in certain image viewers or is blank/black. That is because all that was added is the header. Image data is also needed! For this I added a few [metro]s to generate random numbers between 0-255. The output image then looks a little bit more colourful now. For some websites and image viewers the End Of Image bytes (FF D9/255 217) need to be added in order for it to be viewed properly. To start this process again send [clear( to [binfile]. This clears all binary data. Below is all of this theory put into one patch. To use it, first click on the button to start the jpg file, then click the toggle button to add lots of random data. This may take a minute or so. Once done turn off the toggle, click on the button to end the file and then write the jpg image. If you know the structure of a certain file type, in theory, it is possible to construct one in a similar way to this. I’ve already used this method to construct a bmp, but they produce far less interesting results. png files seem to be more fragile and, as such, I haven’t managed to create one using this method. If you use a second [binfile] object you can load the bytes from another file and use them, in conjunction with random data, to produce glitchy – but slightly recognisable – images! Is it also possible to reduce the size of the jpg header even further? Holger Ballweg (uiae) has recreated this progress in SuperCollider. Check it out!